Many Canadians, even some Winnipeggers, might be surprised at that cultured confidence. But 5468796 is leading a new generation of local architects to invent a new city, and perhaps a new Canada, that gives innovative architecture a seat at the table. Manitoba’s capital city, after decades of stasis, is seeing an architectural rebirth, and 5468796 is at the centre of it. The firm is just seven years old, and its three partners relatively young: the Finnish-born Hurme is 38; the Bosnian-born Sasa Radulovic, 41; and Colin Neufeld, 38. Yet they’ve managed to realize a remarkable set of projects. Among them are a condo building with units that fit together like a 3-D puzzle. As well, there’s been a renovation that added sleek steel balconies to a historic facade on Portage Avenue, and a bandshell with walls made from 20,000 pieces of aluminum chain mail. 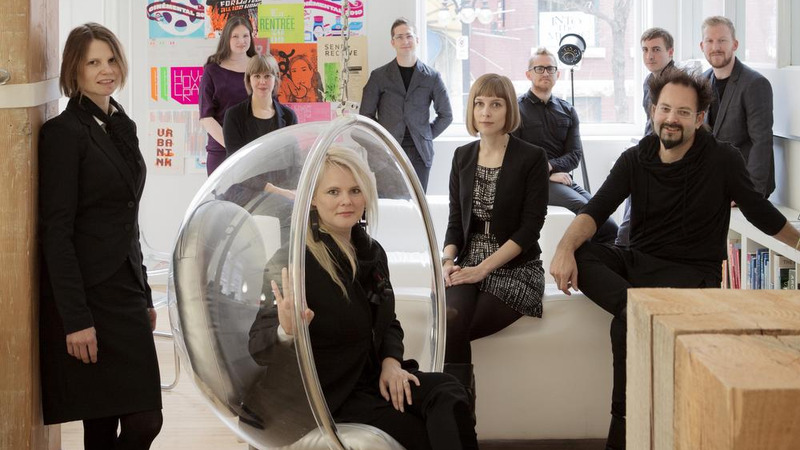 They’ve won Canadian and international architecture awards, consistent attention from design blogs, and a partnership with a New York think tank. If you are a young English-Canadian architect with ambitions to design innovative buildings, the route to success can be long and circuitous. After working in the right offices and completing an arduous licensing process, you may teach, and take whatever work you can get renovating kitchens and houses. By then, you are probably pushing 40. Next, you seek out meaningful work, where you can control the details and the materials to realize your vision. This usually means homes for affluent and engaged clients, and then public buildings – if you can beat your more experienced peers for the job. Then, you retire. This is why too many Canadian architects are stuck in a prison of polished concrete, making beautiful buildings for the very few. The three partners of 5468796 have demolished that model. After a couple of years working with the local firm Cohlmeyer Architecture, Hurme and Radulovic went out on their own in 2007, and were soon frantically busy; their friend Neufeld joined shortly afterward. For a collective name, the trio chose their incorporation number. 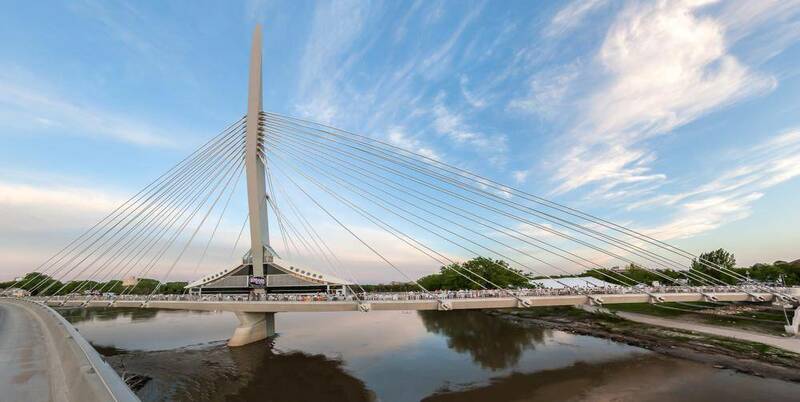 As it turns out, they had also chosen a good moment: The past decade has seen a rise in construction in central Winnipeg, and a highly visible set of new building projects, from the Esplanade Riel by Étienne Gaboury to the Canadian Museum for Human Rights. In this environment, 5468796 distinguished themselves with their design ambition and their entrepreneurial hustle. In the first seven years of their practice, this has meant dealing with the tight budgets of non-profit work and with the no-frills outlook of for-profit developers. At its best, their work makes the most of simple, formal gestures. A couple of weeks ago, Radulovic drove me around central Winnipeg in his black BMW Z4 to see a few of their buildings. 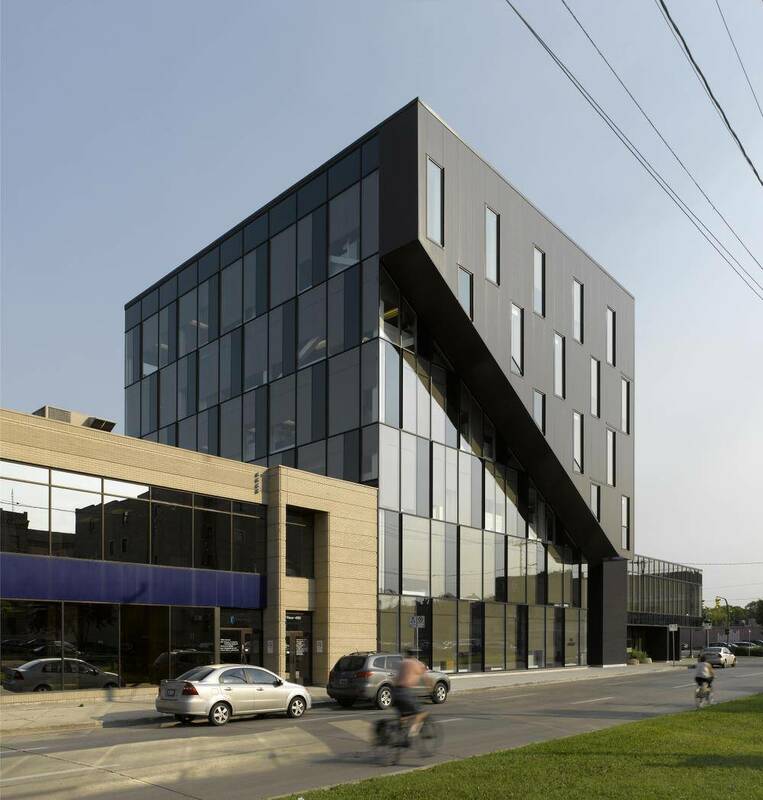 Leaving their office in the Exchange District – Radulovic lives in a loft around the corner, in the same warehouse as Hurme and her husband – we arrived at their office complex for Winnipeg’s Regional Health Authority. Here, 5468796’s design took the building’s stairs to the outside, turning them into diagonal curving lines; the building appears as two wedge-shaped masses, the lower one wrapped in a glass curtain wall; the upper one in a taut, black-metal cladding. It achieves a strong aesthetic effect at very low cost. But craziness is an asset: “To get attention for a new project downtown, it’s got to be special,” says Penner. This is largely because of the example that 5468796 has set. “They push the envelope as far as they can on every single project,” he says. Their ambition usually goes well beyond surface treatments, and the results can be messy. I saw this as I stood with Radulovic in a muddy field in the west end, meant to be a courtyard for a set of low-rise condo buildings dubbed BGBX. 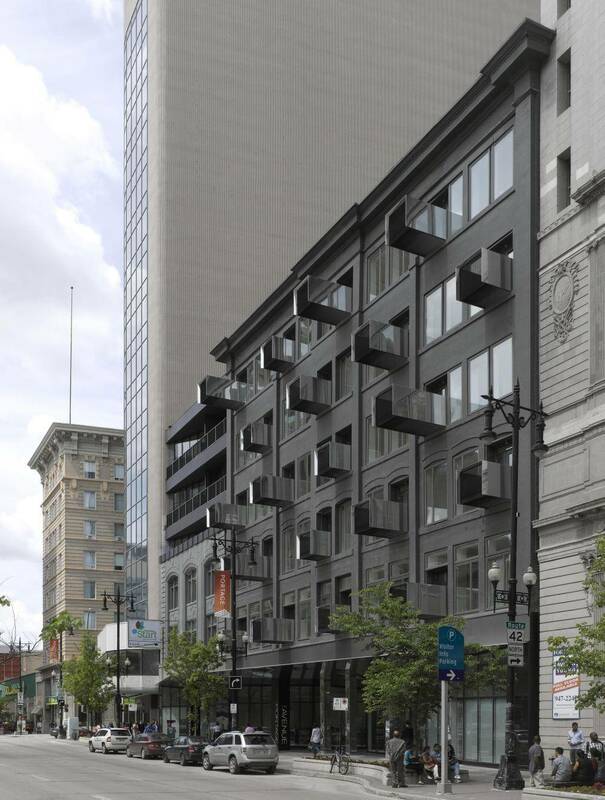 “You can see the possibility here,” said Radulovic, gesturing to the buildings’ inner faces, wrapped in reddish weathering steel and cement-board panels painted in a pixelated pattern of yellows and greens. The outside of the complex is clad in corrugated steel, to echo the industrial shed across the street. The project deserves the international award it won in 2010 – or it will, when the last two of its six buildings are up and new greenery in the courtyard is drinking up filtered rainwater. When it gets there, the project will depend on a shared public space. This is one of the hallmarks of the firm’s buildings so far: Several of their residential works create villages of units around courtyards. They’ll carry that into their first Toronto project, too. A low-rise housing development dubbed Tree House in the city’s east end, it promises to be very interesting indeed. 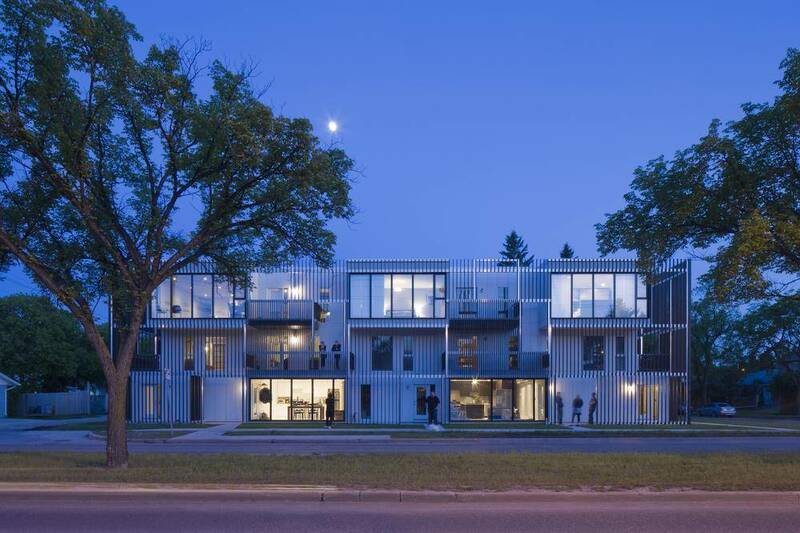 Another new project, on Winnipeg’s Stradbrook Avenue, is a walk-up apartment building, straightforwardly constructed, and then wrapped in a skin of reflective glass panels that sit, overlapping each other, on exposed clips. The reflections of the leafy street trees shimmer on the facade. This building is improbably pretty. The attitude is badly needed. And the work, I think, will shape up to match the bravado: A few of 5468796’s projects so far, including the two that have won them Governor-General’s Medals in Architecture, are truly excellent. But the rest are at least good; and, more importantly, they are ambitious. Their quality of interrogation and exploration – of squeezing some real architecture out of every job – sets a powerful example.